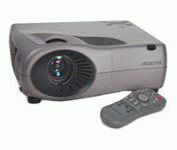 Microtek's CX4 Digital Projector has the astounding brightness and quality you need for all your large presentation needs. With native XGA resolution and 2000 ANSI lumens of brightness, the CX4 is the ideal projector for large group events. The projector has a plug-and-play connection and a full suite of connectivity options, and its light weight makes for easy transport either in-house or on the road. Your audience will also appreciate the extremely realistic and dazzling images the CX4 provides, with its high 1024 x 768 XGA resolution. A full-featured Remote Control with USB mouse capability is included to let you access the projector's control functions with ease.